Offer Details: Come to either of our locations and receive 2 complimentary tastings! 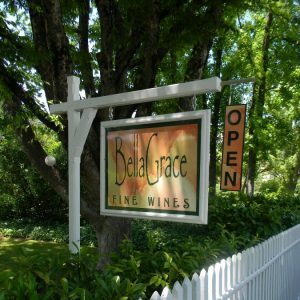 BellaGrace has two wonderful locations for you to taste our award winning wines. The tasting sites allow you to experience our wines, or just “kick back” and enjoy a glass of wine. We offer weekend tasting (> 60 degree weather permitting) in our lovely gardens, vineyards, and soon to be completed wine caves in the Shenadoah Valley outside of Plymouth. In historic Sutter Creek, you can visit us at our 1860 era Victorian house, open Thursday – Monday for wine tastings. For more information regarding 73 Main, please call 209.267.8053. Check our website or Facebook page for up to date infomration regarding our tastings. Our estate grown Rhone varietals, along with our Zinfandel and Primitivo, thrive in the warm, inland climate of California’s Sierra Foothills region. Every bottle bearing the BellaGrace label reflects our fundamental philosophy of doing things right at every step of the winemaking process, from vine to bottle. This commitment to quality pays off — our 2010 Old Vine Zinfandel was awarded Double Gold and BEST AMADOR ZINFANDEL at the 2013 Amador County Fair Competition, and our 2010 Barbera and 2011 Grenache Blanc were awarded Double Gold 98 pts and BEST OF CALIFORNIA at the 2012 California State Fair! Lingering in the memory of shared moments, among friends and family, is a bottle of BellaGrace wine.